The new pulp hero that is devilishly dashing! I am the proud owner of this book, number 33 in a singed limited edition! Doctor Darius Dungannon “Dare” Devlin is the new pulp hero o the block. Cast in the mold of Doc Savage, Devil is the genetically superior super genius product of a group known as the Perrfectibilsts, men and women dedicated to making mankind the best that can ever be. From his headquarters in the uppermost floors of the Chrysler Building, Devlin and associates tackle problems all around the world. Like Doc Savage, Devlin has five associates that aide him in his life’s work. Commodore Bartholomew Masterson “Egg” Cruiks is a fashion plate financer and lawyer whose girth is equal to his height. Commander Aloysius Fauntleroy “Pug” Belgrave is a short stocky bulldog-faced biochemist. Colonel Pukka Singh “Tiny” Soorma is a turbaned, bearded giant Sikh warrior and electrical wizard. Major Chulongkorn Nai “Big Tom” Khanomtom is a short slender aeronautic and structural engineer who was also a martial arts expert par excellence! And Professor William Wilberforce Wordsworth “Whitey” Washington is a tall thin octoroon albino who is the world’s foremost authority on linguistics, history, and the natural sciences. The large story in the book concerns a demon-masked oriental named Orochi the Demon from the Sea, who is master of the Brain Destroyer. However, he has stolen the technology from the Devil Doctor Wu-Hanshu! 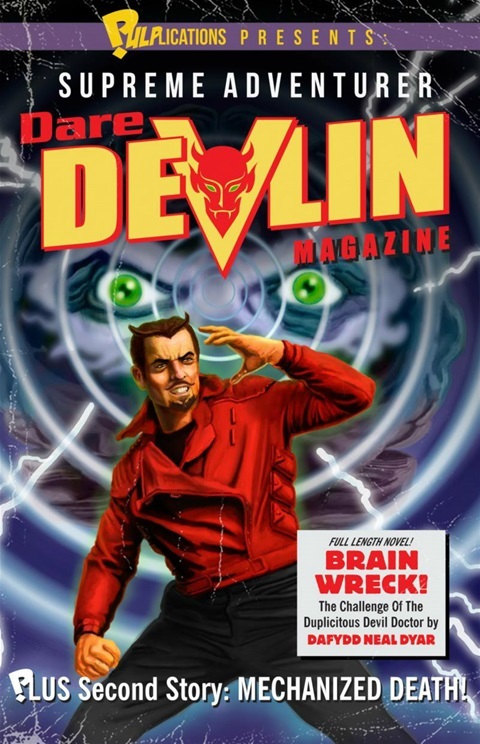 Now Devlin and company, which includes his cousin Cat Devlin, are in a battle with both the masked master of the brain-wrecker which strangely enough doesn’t work on Japanese people and the Devil Doctor with his store of poisoned pets. The action is fast and furious from the skyscrapers of Manhattan to a voyage via submarine beneath the polar ice to the islands of Japan. Battles lost and battles won blur into each other. Devlin must find a counter for the brain-busting device while outthinking the fearsome Wu-Hanshu simultaneously! There is a very unusual reveal that you have to read to believe! The short story pits Devlin against the monstrous Machine Man during the New York World’s Fair. He uses the captured technology of the mysterious Hell-Bat to take a plunge from the Chrysler Building to his riverside warehouse, a plunge that takes nerves of steel! Shades of the Avengers enemy Iron Skull, the pituitary giant from Doc Savage novel The World’s Fair Goblin and of course the Batman romp through the tale like ghosts in a haunted house! And yet the originality of Daffyd’s prose sings all though the tale. If there is one thing I would say may need work, it is the over-descriptive flow of the narrative. I would say it is a little TMI, but this is pulp pure as driven snow.